Would you like to feel nimble and agile during pregnancy? To move gracefully and without pain? To run marathons and do the splits (haha… just kidding!). Well guess what… stretching is the answer to your prayers! Stretching is all too often an overlooked exercise. We focus a lot on strengthening, but forget to stretch and stay mobile. To experience a pain-free pregnancy… we need both STABILITY and MOBILITY ie. strength and stretch. But how do we stretch out those hard-to-reach pregnancy aches and pains? For some women it may be full-body stiffness that has got them struggling to move around but for most women there are a few key areas that once stretched can make you feel like new again. How often should we be stretching? If you are in pain or feeling uncomfortable then I’d recommend stretching 1-2 times per day. If not then having a good stretching session 2-3 times per week should be sufficient! Cross your opposite ankle up on to your knee. Gently press your elbow down into your knee and lean forward into the stretch. Hold for 20 seconds, repeat 3-4 times each side. Lying down, hold your opposite knee and bring your knee across your body as far as feels comfortable. Try to keep your opposite shoulder down on the mat. Hold for 20 seconds and repeat 3-4 times each side. Same as seated pretzel stretch but lying on your back. Hold under your knee and bring in towards your chest. Hold for 20 seconds and repeat 3-4 times each side. Seated single leg hamstring stretch. Tuck one knee in and extend the other leg out. Reach your hands forwards towards your toes or as far as feels comfortable. Try to keep your back straight. Hold for 20 seconds and repeat 3-4 times each side. Place your feet slightly wider than hip width apart and gently roll your trunk down. Hold for 20 seconds and repeat 2-3 times. Place your feet even further apart if you want to stretch your inner thighs. Same as seated hamstring stretch but rotate your trunk away from your leg. Place your hand on the inside of your leg and press your body away from here. Hold for 20 seconds and repeat 3-4 times each side. Bring the soles of your feet together and relax your knees out as far as feels comfortable. For a deeper stretch bring your feet closer to your body. Hold for 20-30 seconds. Note: if this causes pelvic or hip pain then please stop. Start on hands and knees then thread one arm under your body and other arm until it is outstretched. Hold for 20 seconds and repeat 3-4 times each side. Start lying on your side with both arms outstretched. Raise your top arm up and over until it is stretched out on the opposite side. Hold for 20 seconds and repeat 3-4 times each side. Start on hands and knees. Round your back up and tuck your chin in. Hold for 5-10 seconds then sink your chest down, arch your pelvis and lift your head. Hold for 5-10 seconds and alternate between these positions 10-15 times. Lying vertically along a rolled up towel or foam roller (position it in between your shoulder blades). Stretch your arms out to the side for a deeper stretch. Hold for 20 seconds and build up to 1-2 minutes as you feel comfortable. Place your elbow at 90 degrees up against a door frame and lunge your body forward until you feel a stretch in your chest. Hold for 20 seconds and repeat 3-4 times each side. Vertical roll and bow and arrow (as above) will also help to stretch your pecs! OK… now we know how to stretch but is there anything else I need to know? What stretches should I avoid during pregnancy? Any stretch that causes pain, discomfort or bulging in the belly should be avoided during pregnancy. You should also avoid “forcing” a stretch beyond it’s natural range during pregnancy. 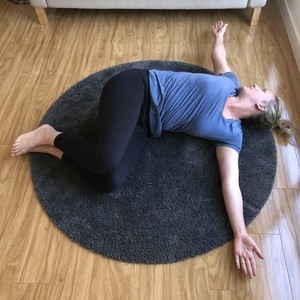 There are no particular “banned” stretches during pregnancy as each woman will be able to cope with a different stretch depending on your own flexibility and what exercise you are familiar with pre-pregnancy. Is it safe to stretch your stomach whilst pregnant? It is recommended to avoid stomach stretches whilst pregnant as this may increase your chances of developing abdominal separation due to the increased pressure on the abdominal wall. Can you hurt your baby by stretching? Absolutely not. Provided you feel comfortable and pain-free whilst stretching then it is completely safe for your baby to continue stretching during pregnancy. So whip out your yoga mat and get yourself feeling limber in an instant! Would you like to stay up to date with my weekly pregnancy email? Click here to join the fun! If you would like lots of amazing pregnancy tips, please like my Facebook page. Could your pelvic floor be TOO tight or TOO strong?